Three years ago, we watched the birds take off with all our sour cherries, leaving only the pits hanging off the stems. That was so disappointing. It did make us wiser so, two years ago, we went to great pains to net the tree and boy, was it worth it. 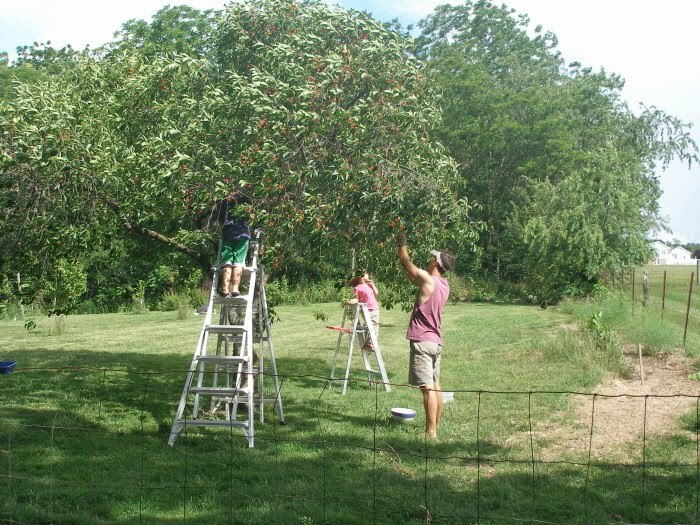 We (along with some friends) picked over 100 pounds of sour cherries that year. I canned and froze them all and it was a good thing because last year we didn't get squat. This year, we had plans to net the tree as we saw cherries ripening, but we had to go out of town unexpectedly and when we returned, the ripe cherries were hanging on that tree as pretty as can be. 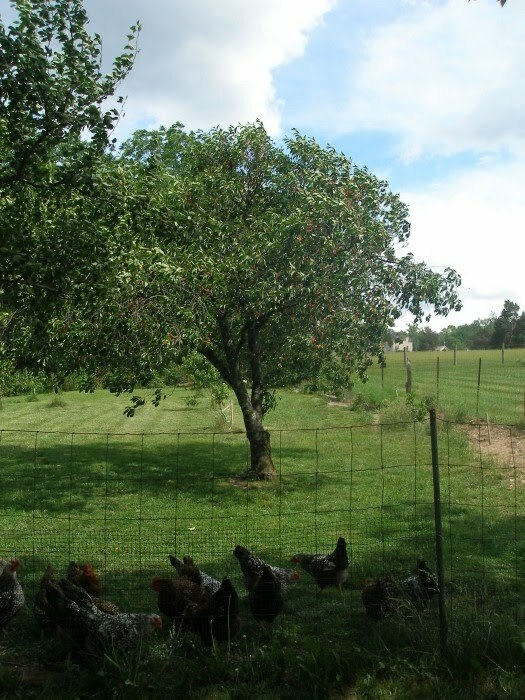 My grandfather (who has had sour cherry trees for decades) says that on years that the mulberries ripen before the cherries, the birds will leave the cherries alone. 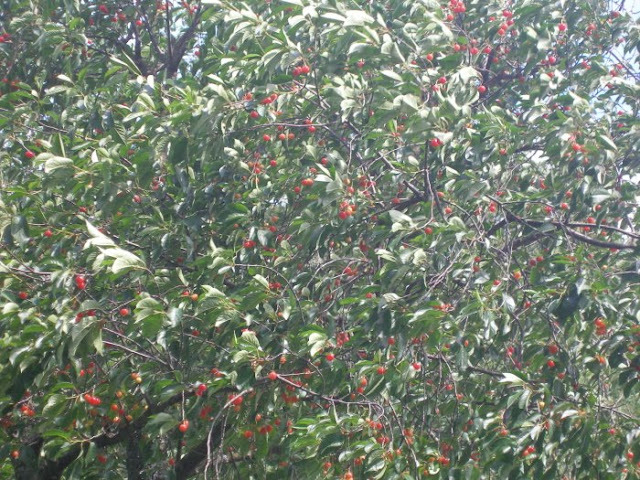 We do have a mulberry tree at the edge of the woods, so I'm guessing we have cherries this year because of it. 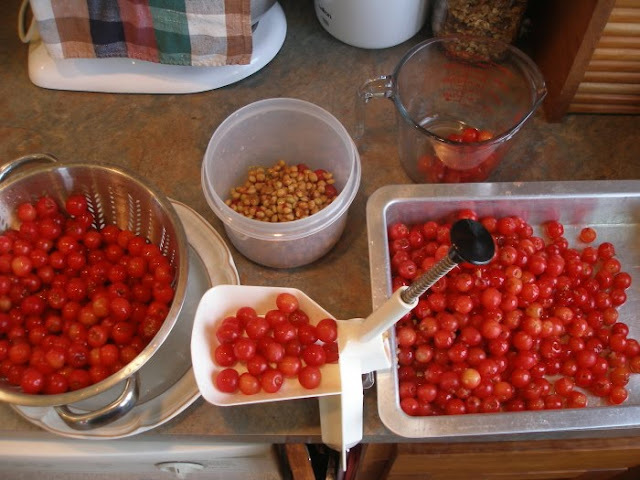 Two years ago, just before the cherries were ready to pick, my in-laws gave me a cherry stoner (also called a cherry pitter) for my birthday. It is an incredible contraption and I would really like to personally thank Theophilus Van Kannel for inventing it but, unfortunately, he passed away in 1919. He also invented the revolving door. Smart fella. Pitting these by hand would take awhile. The stoner works by pouring the washed cherries into the hopper on the left. With your left hand, you feed the cherries, one by one, into the pitting or stoning slot (not official terminology, I am sure). Then, pressing down firmly and quickly on the plunger with your right hand, the pit is punched through the cherry, the cherry pops off the plunger and rolls out and into your bowl/pan. The pit is caught beneath the contraption in a little holding tank until you're ready to slide it out and empty it. 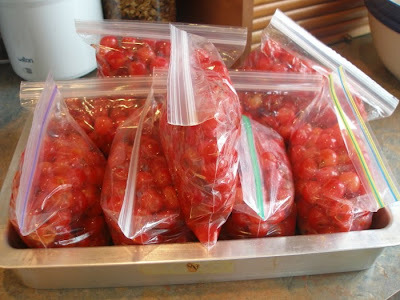 To freeze the cherries, you simply wash them, pit them, and fill bags with them, making sure to squeeze out the air. Once again, get the kids involved! Find some neighbor kids, nieces/nephews or grandchildren if you don't have your own (with their parent's permission, of course). Kids love pounding the plunger and watching the cherries pop out. I freeze mine 3 cups per bag because I need 3 cups of cherries to make my Grammie's Sour Cherry Pie which is even more special this year. 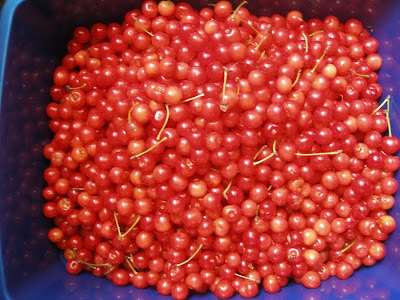 I also like using these cherries to make Sour Cherry Crunch. I can sour cherries as well just for eating and I'll be telling you about that soon. Sour cherries ready for the freezer. Kelley, They are sour. It's difficult to eat them plain. The kids do it just so they can pucker their mouths:-). They have great flavor, though, so they are perfect in desserts. Thanks for confirming that no sugar is necessary! 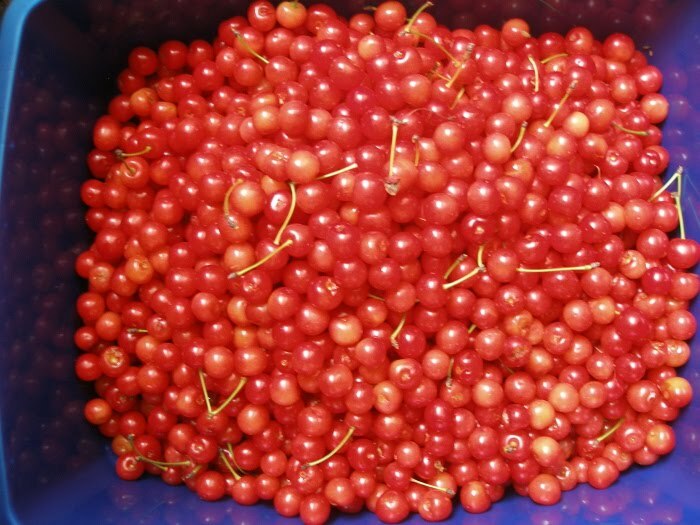 I buy my sour cherries at the local farmers market and of course they are only available once a year for a few weeks. I buy 3 little boxes each weekend and don't necessarily want to make pie or jam every week...so this year most of them will be frozen! I just didn't want to add sugar to all of them.